Make your own tangy tonic water using natural herbs and flavorings from around the world. Whether you're polishing your advanced mixology skills, or you just enjoy the taste of a fine cocktail, this tonic water kit needs to be in the mix. Created by a botanist with a love for DIY projects, the kit includes all-natural ingredients sourced from all over the world: cinchona bark from Mexico, star anise from China, juniper berries from Albania, and more. What you won't find in it is artificial flavorings. Mix the ingredients together according to the included recipe, adding your own citrus and sweetener to taste, and you have a concentrated tonic syrup. 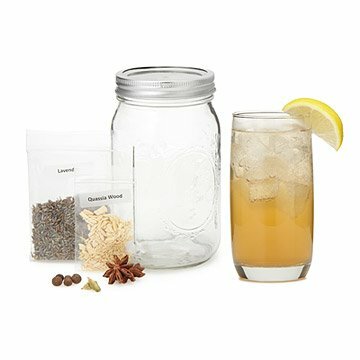 The kit comes packaged in a Mason jar that's perfect for steeping the mixture. Then simply add club soda to create just the right amount of fresh, flavorful tonic water. Makes a great gift for the cocktail connoisseur in your life--or keep it as the secret weapon of your home bar. Pictured drinking glass not included. Kit assembled in Carson City, Nevada. Want some gin to go with your tonic? Check out our Homemade Gin Kit. Check out our Gift Lab to see a member of our team taste test the Tonic Making Kit! Janel Johnson's mom taught her to be resourceful and crafty, encouraging her to take on many do-it-yourself projects growing up, from cooking and sewing to woodworking and home remodeling. A botanist by profession who specializes in rare plants of the Great Basin, Janel's knack for creativity and knowledge of flora led her to make homegrown cocktail kits after she attempted to concoct her own bitters. She realized that there might be other people who want to experiment with making their own cocktail ingredients at home, so she created her DIY sets so that others could have fun experimenting without a huge investment. Packaging: 6.5" H x 3.75" Dia. Pictured drinking glass not included. Please note: Fresh fruit, lemongrass, sugar, salt, water, and club soda required (not included). Tonic is a non alcoholic beverage. Tonic Making Kit yields 120 - 144 oz of concentrated tonic syrup depending on amount of sweetener used. When syrup is diluted, yields 4.6 - 7.8 gallons of tonic water depending on dilution rate. Purchased this for a gin & tonic lover. They were very happy with this gift! I would definately buy this again and again. Very fragrant herbs-fresh. He loves to cook and entertain. Looking forward to trying it with black tea-?a sort of Earl Grey? I ordered this as a gift for my husband, and it worked out really well. There are a number of different variations you can try and he is enjoying making it. He gave out samples at a gathering with his friends and everyone loved it! It does take at least a week to produce a batch, as it has to sit for a day or two after a few of the steps, but it is well worth it. Can't wait to taste the next batch! After trying homemade tonic several months ago, I just had to get this gift for my husband. He loved it! Such a unique, unusual gift for an adult instead of the typical clothes. The tonic turned out great and we're enjoying it in our evening cocktails! After a call to customer service to confirm that the tumbler was part of the product, it was shipped without a tumbler and then I was told it wasn't part of the product. No offer to fix it either. Simple and thoughtful kit with clear instructions and nice packaging. It's in the making as I type this! Bought this as a gift to complement the purchase of the gin making kit. This kit is a great compliment to the Make Your Own Gin kit. I have a friend who is a lover of Gin and Tonic and giving a make your own kit was fun and a creative gift idea. Add a lime tree and you're all set! Great way to get creative! We already had a seltzer maker, so this was an obvious choice. It's so easy to make or make your own variation. The kit comes with the basic ingredients (you must add fresh citrus) as well as some extra seasonings that you can use of you like. Note that it takes a few steps over a couple of days to complete - nothing difficult, but that you will not have same-day tonic.